The PRIMERA LX1000e packs many features into a professional full colour label printer. The LX1000e arrives as a ready to use colour label making kit including the printer, print head, separate ink tanks, cables, roll of labels and start up DVD to walk you through connecting your printer to your PC or Laptop. We even include a choice of the popular BarTender Lite or NiceLabel Lite label design and print program for your Windows PC or Laptop, as well as Windows and Mac OS drivers. Its simple to drag and drop your product photos and logos onto the label designer and include instructions, ingredients, barcodes and expiry date for example, then print 1, 2, 15, 100, or thousands, as many labels as you need for that product or package. The all metal parts and case case ensures a very long working life and robustness for use in a busy office or a factory environment. We supply pre-cut label rolls in over 5000 sizes, the rolls of choice are loaded to the internal roll un-winder protected by the case and so to keep any dust out of the printer. The printer self loads the labels and aligns the images to each label accurately as it prints. With the capability to print any size full colour labels up to 8 inches wide on a roll, the LX1000e has new pigment ink printing labels with extra durability against sunlight and better resisting attack from moisture, chemicals and solvents. When combined with say our SJet © matt white polypropylene self-adhesive label media printed labels withstand outdoor use, even extended testing by marine submersion to satisfy the extreme durability requirements of GHS /CLP/ BS5609 chemical labelling and international shipping requirements. Most will use our popular AJet gloss white ink paper, BJet matt white ink paper or the HJet satin pp or YJet Gloss pp as needed for best effect. We stock a large range of label media types so ask us whats best for your application and for print samples. 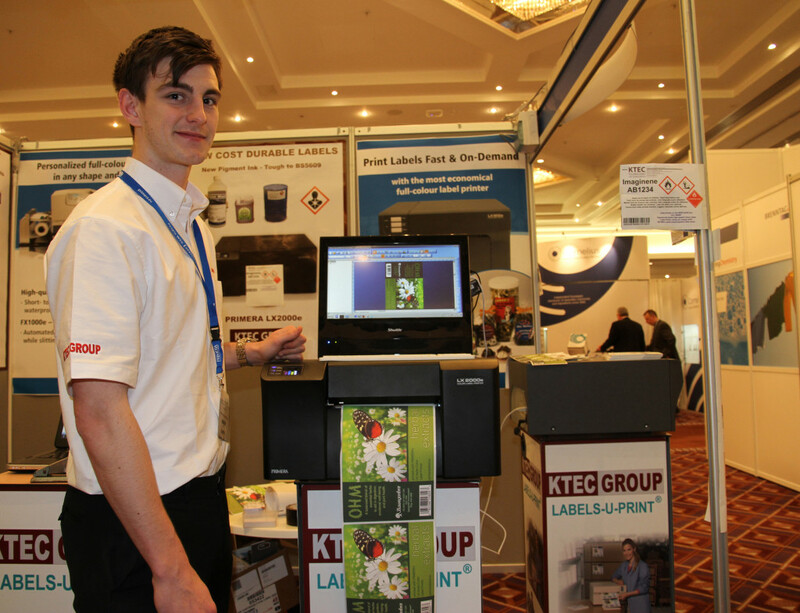 The PRIMERA LX1000e being demonstrated by KTEC GROUP printing large A4 drum labels at a recent chemical products trade show.